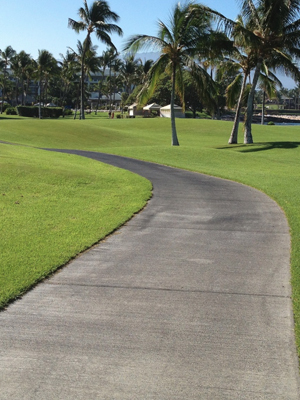 Concrete pathways are a permanent, low maintenance, and valuable addition to your home that can improve its appearance, give a guided walking area, decrease erosion, and are a great way to keep things looking neat and tidy. Building one can be a labour-intensive and costly project, but we can make this a breeze and very affordable. There are many styles and designs to choose from. 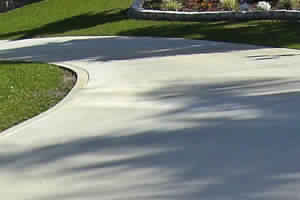 We have a range of plain or coloured concrete, exposed aggregate or covercrete (stenciled) pathway options for you to choose from winding through your garden landscaping. Perfect for no-slip, no-mess entry points to your home, or to simply lead you to useful areas such as the garden tap, shed, swimming pool or entertaining area, our wide range of concrete will match your garden concept or chosen exterior colour scheme. to your home colour scheme, complimenting it’s style and your surrounding landscaping. 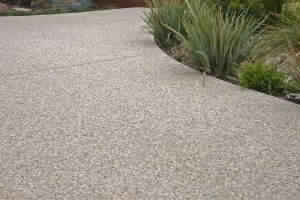 Concrete or exposed aggregate both provide excellent grip underfoot, which makes it perfect for flat or sloping pathways. From a textured pebbled finish to coloured oxides, we are the experts when it comes to choosing the best concrete product for your pathways! 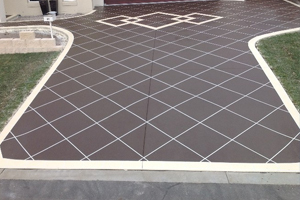 CONTACT US TODAY FOR A QUOTE ON A CONCRETE DRIVEWAY!